Ceilume Petal Ceiling Tiles were used to create a lit canopy effect over the game room pool table. The final outcome was fantastic! Everyone loved it. We did not use any fancy fixtures for the tube lights those were hanging over the tiles. It appears like a canopy when lighted up. At the same time it is also hiding all the vents and ducts. We are very pleased with the final result. Thank you for your suggestion. You will see a lot of granite all over the place including the stairs. 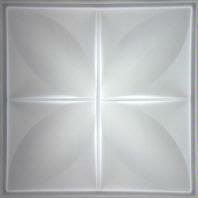 Your ceiling tiles compliment my natural stone tiles very well. Thanks again for all your help.